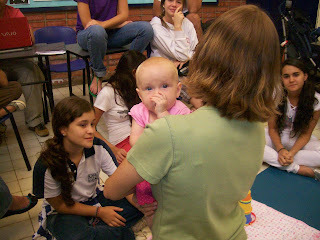 Claire visited Regan's grade twelve psychology class when she was about three and a half months. We thought it'd be nice to return. Claire hit snoozy time with the same group as our last visit but she stayed awake, dazzling all with little coos and playing with toys. 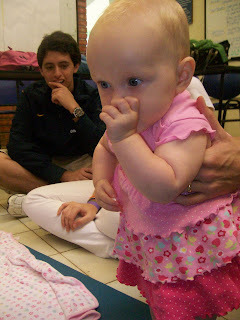 Students talked to her, held her, played with her, and asked a few developmental questions. Here are pictures from one class period. Such a cutie! I wanna dress Nathan in girls clothes! Claire is soo cute! I can't wait to meet her in may.